I have made these black bean quesadillas a few times and I am always surprised how filling they are! 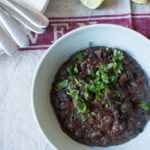 They are deliciously full of black beans, spices and cheese and are really simple to make. 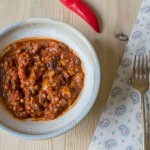 You could add different beans, leftover chilli (or maybe leftover vegan chilli) and serve with your favourite dips. I love scooping up a big load of guacamole; but then I am a guacaholic. Sour cream, chilli sauce, salsa or whatever you like would be amazing on the side of these. One quesadilla each might not sound like a lot, but they are seriously filling. Heat a little oil in a small frying pan on a medium heat and add the onion. Fry for around 10 minutes until softened, stirring regularly. Add the black beans and the spices and continue to cook for another five minutes. Mash the beans up with the back of the spoon, keep it quite chunky, and season with a little salt and pepper. Divide the bean mix between two of the wraps and spread the mixture over so it’s coated in a thin layer. Sprinkle the grated cheese over the two bean wraps then top the cheese with the other wrap. Put a large frying pan on a medium heat and add one of the quesadillas. Leave to dry fry until it’s toasted on the bottom, then flip over and toast the other side. Repeat for the other tortilla. While you’re waiting for the quesadillas make the guacamole simply by mixing all the ingredients together until smooth or chunky, depending on how you like it. You can add some chillies, chilli sauce or anything else you like in your guac. Chop the quesadillas up and serve with the guacamole. When the cheese melts all the way through these it picks up some of the spices along the way so when you bite into it and get the mix of gooey cheese, fibrous little black beans and softened onion it’s a match made in heaven. If you wanted to try and make these without cheese you just need to mash up the beans a little more so they are easy to spread. A few bits of diced tomatoes, a squeeze of fresh lime juice or some jalapenos are also well worth trying. This is my current favourite veggie recipe! Filling, delicious and healthy as well! My kind of quesadilla! It’s amazing how little you miss meat when you have other hearty fillings. This looks like the perfect quick lunch – love black beans and I can never resist guacamole. Lovely combination! Mmmm….cheesy quesadillas with black beans! And best of all, I love that you served them with guacamole!!! Looks like you are in my part of the world, Caroline! Sounds fab! I love recipes made with beans, and these black bean quesadillas look so satisfying, flavorful and delish. What a great meal, so satisfying and flavourful. These are a really tasty lunch. I love this idea! i love black beans! they’re my top choice when meat is off the table. your quesadillas sound great, and understandably filling! I could really just subsist on GUACAMOLE. I just love black beans and fresh Mexican food. I seriously could eat this food everyday and be happy lol. These tick all the boxes – cheap, healthy and delicious! I love the no cheese option and let’s face it, there’s no such thing as too much guac! 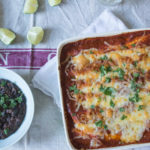 I love Tex-Mex, Mexican and all these types of meals! These quesadillas are having my name written all over them!